The hour is late and I really should be heading to bed. I grab my phone to return it to the charger. As I shut down each of the apps I left open over the course of the day (I have a serious problem), I take one last stroll through my social media channels. The feeds flood with images and tweets, posts and pins. It seems there’s been a blogging event locally I didn’t get an invite for. Many of my friends smile brightly and look like they’ve had a great time. An author friend hit the bestseller list – again. That influencer I’ve known for close to a decade was invited to share her platform on a national TV show. If I’m not careful I allow myself to go there. I engage the jealousy. I wish for her amazingly curated Instagram channel or I dream about speaking on a stage at that conference. I long for the hit podcast or the opportunity to be whisked away to NYC to be yuk it up with the witty hosts of a morning show. I give into the temptation of thinking that if I could just write that one viral post or I could just develop a slamming podcast or if I could finally figure out how to YouTube my ALDI haul well, I would arrive. All of the invitations would flood my inbox and my platform would balloon to well over a million followers overnight. I’d land the endorsement, the book deal, and the signature line of products to be sold in big box retailers everywhere. 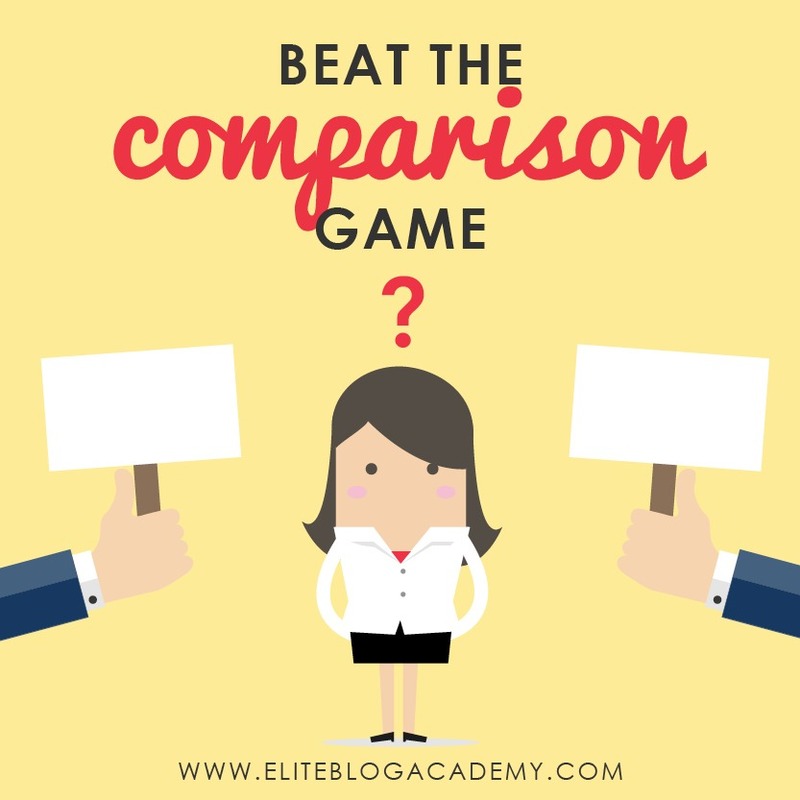 For those of us who make our lives online and daily navigate numbers, the comparison game becomes more than just an imaginary battle. We know where we rank on Google. We can see how many followers, fans, and subscribers like us, share our posts, and open our emails. We can easily compare and contrast our own numbers with those of others. How can you learn from the platforms of others without comparing? How can you be grateful for and even champion the success of bloggers without wishing for what they have? What concrete strategies should you take when you feel the pull of follower envy? These steps can guarantee you won’t ever struggle again, but they can help dial down the temptations. If you gain nothing else from this post, I want it to be this. In fact, if we were sitting at my kitchen table right now, I’d grab your chin and look deep into your eyes. We’d quit doing everything else and have a focused moment. And I’d say these words with a sincere heart. You are not a number on the scale. You are not the amount of money you make. You are not the checked off boxes on a to do list at the end of a productive day. You are not how many cars you own, the number of bedrooms in your home, or the number of vacations you have taken this year. You are not a retirement account with a slamming interest rate. You are also not pageviews, an email subscription list, or today’s shares on a post. Your value doesn’t come from who chooses to follow you or who chooses to unlike your page. It doesn’t arise from the products you’ve sold or the fact that no one seems to click no matter what you do. Since I’m a person of faith, I’d assert your value comes from a Creator who adores you. You’ve been made for a purpose and that calling moves beyond numbers. Repeat it with me, now. While it is wise to know what others in your blogging niche are doing, it’s not wise to set your sites upon their success as a measurement for your own. You need concrete goals when it comes to developing a platform. However, those goals can’t be based upon another influencer. After all, while you are not a number you are also not another individual. Your paths are unique and so will be your progress. Choose goals that can be broken down into smaller parts. Be sure those goals are measurable in some way. And celebrate – I mean PAR-TAY – when you hit both the small goals and the big ones, no matter how long it takes you. Few grow an instant following overnight. Many struggle years to find the sweet spot of communicating well with an audience. The success of others often deceives us because we don’t see the hours spent agonizing or the hard work necessary. We get a front row view of the shining moment without seeing the difficult road traveled leading up to it. While you may have similar goals as others, no one travels the same path. Working online means we can be constantly exposed to the good, the bad, and the ugly of social media. Our eyes, minds, and then subsequently our hearts constantly receive messages all day long. We know which viral videos will make our readers laugh uncontrollably. We know what Pinterest recipes are poised for success. We’re usually able to identify which trends will become clickbait gold before the rest of our friends and family. But, the Internet isn’t always the best influence for our souls. The more we know about what we don’t have, the more we want things we can’t afford. The more we realize we weren’t invited to the party or the event or to speak at the conference, we more we struggle with confidence. From time to time, it becomes necessary to take a break from the noise. If the channel isn’t bringing you life right now, hit the hide button. If the platform seems to cause you to long for something that’s not yours each time you open the app, delete it from your phone. If the email overwhelms your soul with all you can’t do or purchase, unsubscribe. You can always return to the site and sign back up at any time. But know when you’re feeling most vulnerable and then make a choice to limit your interaction. I was reading a wise philosopher this week. OK, so it was a meme on Instagram, I’m pretty basic no matter how much I’d like to have you imagine I was sipping an espresso, wearing a beret, and reading antiquities in library with lots of leather bound books. Nope. In reality, I was eating ALDI’s version of Frosted Mini-Wheats in my kitchen while wearing my well loved Wonder Woman pajama pants and black hooded sweatshirt. Anyway, the meme said, “You Focus on the Possible. Let God Do the Impossible.” I like this catchy turn of the phrase for more than one reason. First of all, the language play is on point. But more importantly, it guides our steps toward what we can do instead of what we can’t. Instead of allowing yourself to be bogged down in what you don’t have or can’t do, you shift your aims. You choose one small action step instead of trying to run an entire marathon. You don’t write War and Peace, you write a single sentence. You don’t try to film an Academy Award winner, you watch an EBA video. You can’t do it all. But you can do something. Don’t try to have it all or do it all, just do the next small item on your list. In the new book I wrote with my husband Brian Your Money, Your Marriage: The Secrets to Smart Finance, Spicy Romance, and Their Intimate Connection, we centered each chapter on a movement. We’re firm believers that anything worth doing in life requires movement. In the end, we discovered improvement requires movement. Chapter 8 of our book encourages couples to move from the Fear of Missing Out (FOMO) to the Love of Showing Up (LOSU). Rather than being constantly concerned about what everyone else is doing or has, we all need to move toward showing up in our own lives. Constant FOMO causes us to never have enough. No matter the professional accolades we gain, no matter the size of our budget, no matter the purchase of the week, it’s not enough. We need more. Sometimes, we’ll allow that deep hunger for more, for “never enough” to create a panic and scarcity in our souls. We’ll begin grasping for anything to fill the hole – thinking the next hit will answer an unknowable questions or occupy an impossible void. The only weapon I’ve known to work successfully defeat FOMO is LOSU or the Love of Showing Up. Only when we recognize what we truly have and become grateful for it, will we eliminate worries over what we don’t have. I know it sounds swell in theory, but there are practical steps you can take. For instance, consider creating a “Love List” when it comes to your platform or blog. Write down all of the reasons why you love doing what you do and the experiences that have brought you joy since you’ve begun. You should also spend intentional time unplugged. Run around the yard with your kids. Brew a fresh pot of coffee and sit down to enjoy the cup (without working). Cultivate habits that increase your awareness of what you have instead of stoking fires of what you don’t have. Realize that you may not have the same opportunities but that doesn’t mean you’re missing out. Oh sweet friend, I wish I could wave a magic wand and make every ache and pain of comparison disappear. I wish I could give you that big break or help you become the next “it” girl or guy online. But we all know that’s not how the world wide web turns. Instead, you have to do the work – both the soul work and the blogging work. You have to make the choice to dial down the noise and focus on where you are instead of where everyone else is. You have to show up. It may not always be easy but it is worthwhile. And on the days when you feel weak, imagine us sitting together at my kitchen table. I’m probably wearing those same worn down Wonder Woman pajama pants and my favorite zip up hoodie. I’m reminding you that what you do matters. I’m pouring you a cup of coffee and inviting you into this moment – where your impact reaches beyond analytics and into eternity. This world needs your blog and your platform. Take what you’ve been given and run with it. Cherie Lowe is the author of Your Money, Your Marriage and Slaying the Debt Dragon. She blogs at Queen Of Free where she encourages others to Pay off Debt and Live An Abundant Life. Thank you for this. I’m very new to blogging so every new followers still feels wonderful but I can see getting to the point where I could start wondering why they have stopped or why so-and-so has this many and I only have this many. I think I’d better print this post out and stick it to my forehead (or some other convenient spot in my office). Oh I love the love list! What a great idea. I certainly have found it hard to avoid feeling like a failure at times when comparing myself to other bloggers. But if I went into specifics on the list above, I can bet it would be long. Reading this post is divine ,as I’m trying to write my first ever post . I got emotional when you say this world needs you and your platform.